Rackspace Cloud is a cloud storage and hosting service provided by Rackspace, a managed cloud computing company. Recently, 2BrightSparks has partnered with Rackspace Cloud so that users can now sign up for Rackspace cloud and back up their data through SyncBackPro. Rackspace Cloud offers a wide scale of cloud hosting services but in this article, we will focus on how to sign up for a Rackspace Cloud account and configure a cloud profile in SyncBackPro to back up your data to Rackspace Cloud. To find out more about what Rackspace Cloud has to offer, you can visit their cloud page. If you do not already have a Rackspace Cloud account, you can create one by using the Rackspace signup page. Credit card and personal information (like address and name) will be required. There will be a manual approval process within 24 hours of signing up. Rackspace support representatives may contact you to provide identification documentation before your account can be approved. If you already have a Rackspace Cloud account, you can skip this step. To get these authorization details, click on your username dropdown menu at the upper-right corner of the Dashboard, then click on My Profile & Settings to go to the next page. On your Profile & Settings page, you will find your Username and your API key. Click on the “Show” button to display your API key. Take note of this information. We will come back to them later. Start SyncBackPro, and create a new profile using the Profile Creation Wizard (Profiles > New). Follow the on-screen prompts to provide your profile with a name, and select a profile type (Backup, Synchronize or Mirror). On the location selection stage, click on either Source or Destination dropdown list and select Rackspace/OpenStack. You can set Rackspace cloud as either your Source or your Destination, depending on whether you are backing up to or from the cloud storage. 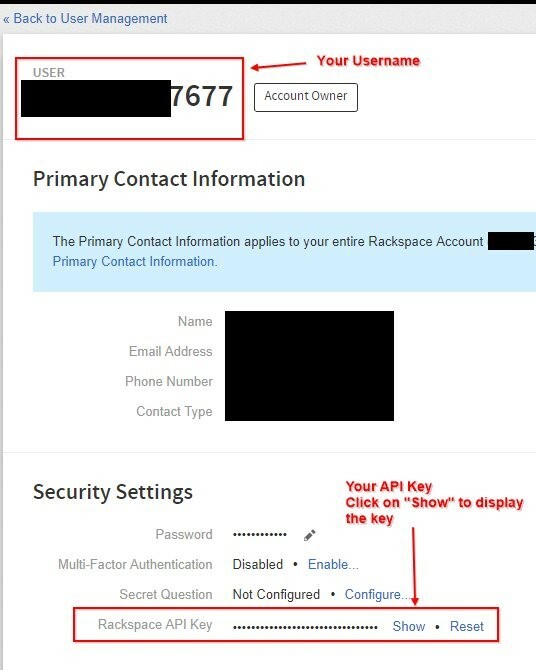 At the Cloud Connection Details stage, you will need to fill in your Username and API key (which you got from step 2 above). Copy and paste the information from your Rackspace Profile & Settings page. After entering your Username and API key, click on the Refresh button to check for existing Containers. Containers are required to store your files and folders. If there is no Container found, create one by clicking on Create. Click Done to complete the profile setup. Your Rackspace cloud profile will appear on the main program window. Click on Run to start a backup. With this guide, you have successfully created a Rackspace account and set up a Rackspace cloud profile in SyncBackPro. SyncBackPro developed by 2BrightSparks offers a convenient and effective way to backup files between your system and your cloud storage servers. In addition to this guide, you may also be interested in reviewing other cloud backup articles on our site. 2BrightSparks also features hundreds of articles in our Support Knowledge Base which you may find valuable.